Donuts & CANTO: Napalm Death, Maryland Deathfest, Samael and more! I really don’t feel like doing these today. Yet, here I am. Lamb of God and Children of Bodom canceled a show in Tilburg due to security concerns. Yes, these downstream impacts will continue for awhile. Thomas Ayad, project manager for Metallica, was among the victims of last Friday night at La Bataclan. Metallica paid their respects earlier today. Barney Greenway will be sitting out two Napalm Death shows. Apparently he will be returning to the UK to deal with some personal obligations. Chris Reese is filling in. Old Man Gloom will be releasing a live album this coming February. It’s going to be called Old Man Gloom: Mickey Rookey Live At London. Puscifer released a new music video for “The Remedy”. Here it is. Quickies: Century Media news, Lars Ulrich can’t market for sh*t, and more! MetalSucks has an interesting exclusive on the possible Century Media Records sale. The guys spoke with Century Media founder Robert Kampf to clarify developments around the label’s rumored major-label acquisition. Definitely worth a read. Black Sabbath guitarist Tony Iommi has followed Napalm Death vocalist Barney Greenway’s lead and written a letter to Indonesian president Joko Widodo, urging him to spare the lives of two men arrested for drug smuggling in the country. This isn’t sarcasm, but I’m genuinely wondering what the tug-of-war in Widodo’s head looks like right now. This week’s album sales numbers are out over at Metal Insider and goddammit, Kid Rock is not only still a thing but also sold 136,000+ of his new album. You win, universe. You win. Oh well, at least there’s Torche. Lars Ulrich claims that one of the songs Metallica has recorded for their as-yet-untitled, as-yet-producer-less new album is “not so bad.” That’s exactly the kind of positive marketing you want in a dying music industry when following up the worst album of your career. Good job, Lars! Pretty sure this dude can do no wrong. Which one? Either of them. Check out the rest of Rob’s videos here. Anyway, that’ll do it for me. Check back tomorrow for more! If you really look at it, from 2000’s Enemy of the Music Business onward, Napalm Death has simply been lights-out. A fifteen-year, now-seven-album stretch like that from any band would command respect, but for one entering its 35th year of existence later this year? That’s special. Bands simply aren’t supposed to have that kind of run left in the tank after that much time in the game. 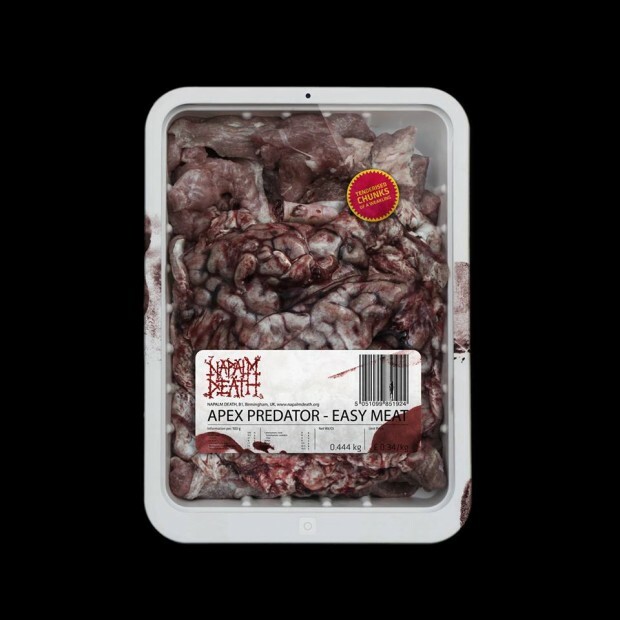 And yet, there’s nothing about the band’s new album, Apex Predator – Easy Meat, to suggest they’ll be slowing down any time soon. On this, their 15th head-crushing venture into sheer brutality, the British grindcore legends sound as vital and aggressive as ever.